We have put almost all date/time calculation and information into this app. We know it will be very helpfully for you. Date-to-Date: Calculate the difference between two dates and show the same difference in different units. Data Calculator: Add or subtract from a given date. 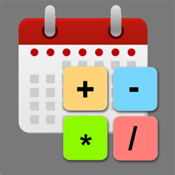 Calendar: Nice calendar that shows the Week and Day number for each day of the year. Time-to-Time: Calculate the difference between two given times. Leap Year: Ever wanted to know the leap years and on which day the Februar 29 goes, we have it, from 1900 to 2100, you know that these two years are not leap years? Countdown: Put a date in and the app shows the remaining time until the event. You see, we have put great date and time calculation and information into this app and we wish that you enjoy it and be well informed.